Machine learning is only as powerful as the data you give it. ExtraHop processes over 1 PB of wire data per day, training our ML on the most objective and comprehensive source of raw network data available. Our platform selectively guides machine learning models on more than 4,700 wire data metrics, allowing for unmatched breadth, accuracy, and focus in behavioral analytics. We also use hundreds of proprietary machine learning models such as peer group anomaly detection to reduce false positives, network privilege escalation detection, and ransomware detection models that specialize in file access and manipulation patterns. ExtraHop machine learning evaluates multiple protocols and hundreds of built-in metrics with custom logic. 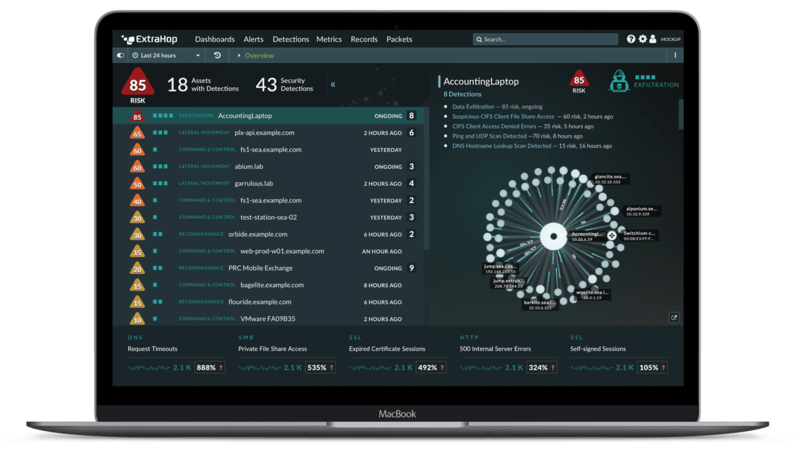 With contextualized wire data metrics derived from L2 through L7 network traffic (including encrypted traffic) plus domain expertise in attack detection, unusual behavior, and risk analysis, ExtraHop is able to provide deeply reliable insights for cybersecurity and IT performance. ExtraHop's architecture uses a unique combination of on-premises tech and cloud services to support the full machine-learning process while protecting the confidentiality, integrity, privacy, and anonymity of customer data and activities. While our machine learning service is based in ExtraHop's cloud in order to scale effortlessly with your enterprise, only de-identified metadata is sent to the cloud. Data categories containing potentially sensitive information such as payloads, filenames, or strings will remain on your premises, and we obtain SOC 2, Type 1 compliance certification for our machine learning service every year. Do IT Pros Think Machine Learning Is Hope or Hype?